Take one widdle canary and one bad ol' puddy tat and you have the makings of a classic cartoon team. In fact, you would have thought this pairing was a natural. But sufferin' succotash, it took several years before the Warner Bros. cartoon crew realized what a terrific twosome they had right under their noses. Tweety worked with other adversaries and Slyvestor acted in various cartoons before they had their first on-screen encounter. The rest, they say, is history. Director Fritz Freleng and his colleagues managed to find an endless array of funny facets to the Tweety and Slyvestor formula-and that's one reason the series remained so consistently funny. This collection ranges from a variation on Jack and the Beanstalk to an Alfred Hitchcock spoof that asks the question, "What would happen if Slyvestor actually ate his feathered foe?" We also get a look at Slyvestor's continuing career away from Tweety in a handful of entertaining cartoons. Tree for Two features another funny pair of characters, Spike and Chester, while Mouse-Taken Identity introduces the irrepressible (and easily embarrased) Slyvestor Jr.
Alone and together, Tweety and Slyvestor are funny characters-and this assortment is proof positive. 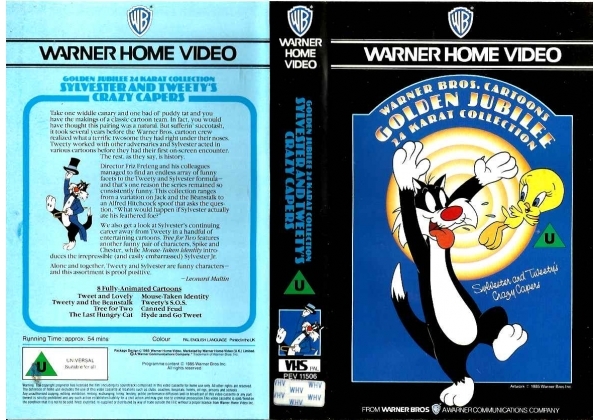 Or find "Warner Bros. Cartoons Golden Jubilee 24 Karat Collection: Slyvest" on VHS and DVD / BluRay at Amazon.